This post acts as an introduction to the webpage betterteaching.ie/failbetter.html and will also be the first link on that page. Why will this post help to make me be a better teacher in my classroom? 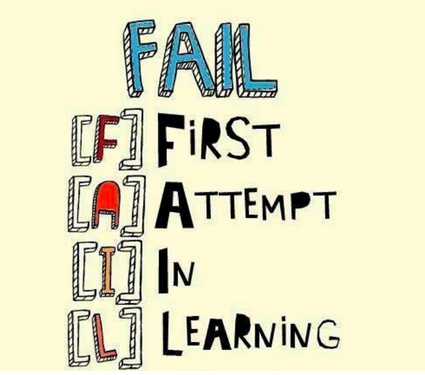 It will help you to realise that making mistakes/failure is a necessary part of the learning process for students. It will help you to help your students realise this. It will give you ideas to help your students overcome their fear of making mistakes and as a result your teaching and their learning will be more effective. 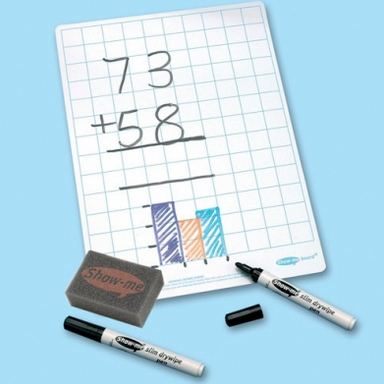 These are called ‘Show-Me’ boards or ‘mini-whiteboards’. They have made quite a difference to the way I teach over the last few years. I got them initially just to try them out and was rather sceptical. After all, what could they do that an A4 page couldn’t? Students love them. Whether it’s the novelty alone or not I don’t know but if they’re lying on the table when they come in they straightaway grab them and start doodling. They like them to such an extent that when I say: “Right, quick test”, their first response (rather than moaning) is to say; “can we use the boards”? But it’s from a pedagogical perspective that they really come into their own. Students don’t like to fail. They don’t like to make mistakes. Mistakes are wrong. Mistakes are bad. Mistakes are to be avoided and creating a permanent record of a mistake is to be avoided at all costs. It’s why students leave lots of blanks on their exam papers. After all, what happens if somebody sees their answer and it ends up on a staffroom wall or worse, an internet site for all to gawp at? But with a Show-Me board all answers can be erased with one swipe of the hand. So it’s much safer to ‘have a go’ at a question even if you’re not sure if the answer is correct. When doing ‘Predict-Observe-Explain’ for a demonstration, ask the class to make a prediction and the usual hands go up, which means those with hands down either don’t know or don’t have the confidence to speak (we’ll conveniently ignore the category of student who just couldn’t give a rat’s arse either way). With the Show-Me board they all have to write something, and (this point is crucial) by holding them up (“show me”) and looking forward, only the teacher gets to see what they’ve written, so again they’re more likely to have a go. I stress to them in advance that’s it’s just a guess – being wrong is not a problem. But by making a prediction they have invested a little of themselves in the demonstration so are much more likely to see how it progresses and more importantly to learn from any wrong answer. Children may perform better in school and feel more confident about themselves if they are told that failure is a normal part of learning, rather than being pressured to succeed at all costs. Eric Mazur is a physics professor who is forcing many institutions in the U.S. to reconsider how they assess their students. His work also resonates on this side of the Atlantic, and not just at college level. In a recent lecture entitled “The Silent Killer of Learning”, Mazur argued that current assessments problematically rob students of the freedom to make mistakes. Mazur also noted that current tests, in an attempt to make objective questions, have stripped away questions that require students to make or form their own assumptions. The importance of this can not be underestimated, particularly in the world of Science where misconceptions are rife and even more so in physics where so many concepts are counter-intuitive to begin with. My page of resources related to science misconceptions. Most people, when directly confronted with evidence that they are wrong, will not change their point of view or course of action, but will dig in and justify it even more. If we are not prepared to admit we have failed, then how can we learn from it? Students now assume that when they come to a difficult patch in their learning, they either put up their hand to get the answer or put the pen down and give up. When you ask them why, they simply say “I don’t know what to do”. The thought that perhaps they could try something to see where it leads doesn’t seem to carry much currency with them. Why not? Partly laziness, partly fear of failure. Imagine your family are held at gunpoint while you are here struggling with this problem. Their only chance of rescue lies with you finding the solution in the next ten minutes. Failure will result in death for all. Will you still give up because you don’t know for certain what the next step is? Or will you make an attempt of some sort because it might, just might, lead to freedom? So why is inaction an acceptable option if there’s no gun involved? Hollywood has it wrong: Failure is an option. Ignoring it is not. By coincidence, uploading this post coincides with the launch of The Science Gallery’s latest exhibition entitled, would you believe it, “Fail Better”. It looks fantastic. Can’t wait to visit. The goal of FAIL BETTER is to open up a public conversation about failure, particularly the instructive role of failure, as it relates to very different areas of human endeavour. Rather than simply celebrating failure, which can come at great human, environmental and economic cost, we want to open up a debate on the role of failure in stimulating creativity: in learning, in science, engineering and design. ← Everything a Primary School teacher (or student) needs to know about gravity. And then some.